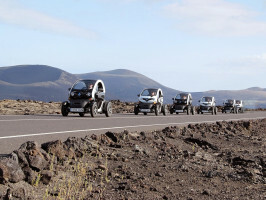 Have you ever wondered what it would be like to drive in the future? 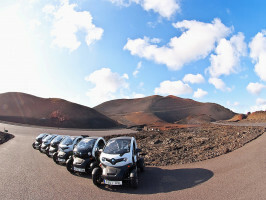 Find out, as you reveal your hidden explorer on an eco-friendly journey through the winding roads of the breath-taking Timanfaya National Park. 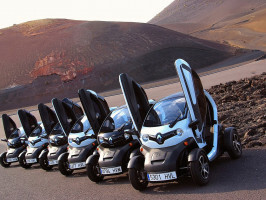 You will be surprised by the dynamics of this little speedster, as you explore the stunning surroundings driving a silent and emission-free vehicle, which in itself is a truly unique experience. You can imagine yourself being on the planet Mars as you discover the mystical world of the Fire Mountains. A must-see for its unique and natural phenomenon caused by volcanic eruptions between 1730 to 1736, which may be the most significant eruptions in the history of volcanism.You will find impressive scenery around every corner as you drive through the lava fields to the dromedary station, the Echadero de los Camellos (camel ride not included). 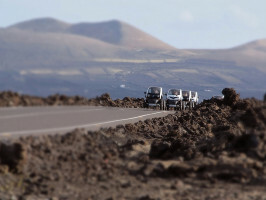 Contemplate the power of mother nature as you wind through the tranquil route of the volcanoes (Ruta de los Vulcanes). Admire the fascinating open craters, huge ash fields and bizarre rock formations. One of the highlights of your trip will be the mesmerizing geothermal anomalies demonstrations thanks to the sheer heat located right under your feet! Temperatures of 610°C have been recorded at a depth of 13 metres, and even at 10cm, the temperatures peak around 227°C. In the visitor’s centre, you will learn everything you need to know about the National Park 's geology, flora and fauna. 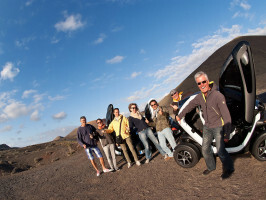 To round up an incredible tour, visit the crater of El Cuervo. The same volcano, which was the start of the series of eruptions started in 1730 and lasted 2056 days, resculpting the island from the incredible volume of lava which made its way from the mountains to the ocean. Don´t forget your camera to capture your favourite moments on this unforgettable, once in a lifetime experience. Vehicles have a maximum capacity of 2 people (driver and companion). Choose from one of the options: Driver option - only one person per vehicle or Driver and companion option - 2 people per vehicle. Driving License type B required. Weight limitation: 100kg. Maximum Height: 190cm / 6´2"
Guide/instructors speak: Spanish, English, German and French. *Should an emergency arise, please call at the next telephone number: +34 971 211601 - 24 hours (Languages spoken: Spanish, English).